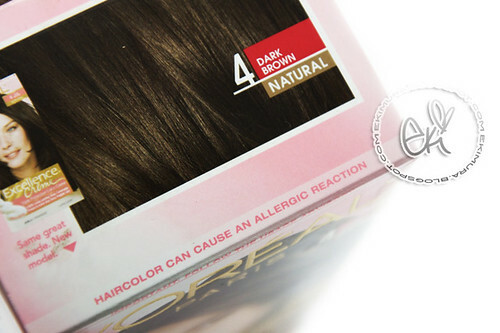 here is my latest dye that I have used Loreal excellence creme in #4 Dark Brown. Comes with extra pre-dye conditioning serum for the end! so that was pretty neat :) so I left of the serum for about 2 min before I applied the actual dye, after I finished applying the dye I took my gloves off to give about 10 more min for it to process so I had it on for about 25min. EEEE!! You made a post about the hair color! I love it on you!! But since it took so much from me to get my hair light, I will be sticking to light hair for a while =P, but when I do want to switch back to a darker shade, I'll definitely want to try this ^__^ Thanks for sharing Eki! Looking gorgeous, eki! :) I think the dark hair really suits your snowy white skin! & thanks for the review, I notice the problem with hair dyes is that there are SO many different brands and sometimes you're just at a lost at a drug store while staring at all the boxes. D: I remember I used this one hair dye that had this TERRIBLE smell. My friend who helped me dyed my hair banned me from ever using that again, haha! The excessive staining does seem like problem...but it's worth the result. :) I love coming to your blog and hearing Bom's You and I and DBSK's Doushite blah blah blah (too long a song name, honestly D:) playing automatically! you look nice with dark hair! i love your new hair color! wow dark hair! love it :) i sort of want to redye mine but i'm at a point where i found the perfect NATURAL hair color for me.. hahaha sounds ironic. Woah! That's a strong dye! I love the new color on you though - very pretty! The darker shade really makes your skin look so white and glowy! :) Like porcelain! 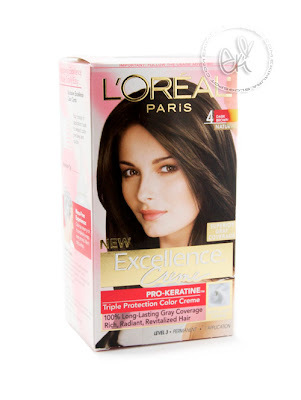 I agree out of all the brands I've tried, I love L'oreal Preference the best! I always go back to it! What is the name of the hair color you have before? Ahhh beautiful Eki, I'm starting to think that no matter the colour, you'll still look beautiful and I think I'm right. I think you look pretty with dark or light hair. I've been following your blog for awhile but never commented. I noticed you dye your hair, usually Loreal or Garnier, and you said you liked Loreal Preference the most in this post. Which one would you recommend a first timer to use? Do you think you could do a collective review post?